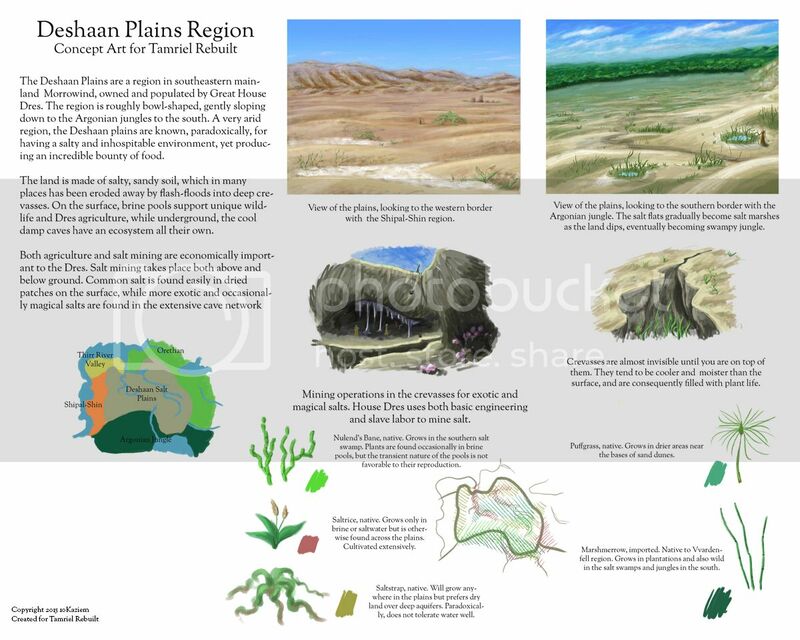 The Deshaan Plains are now in Stage 3: Document improvement. This means that we are refining the information in our document, not making major changes. Please read BOTH DOCUMENTS before posting. Please also keep all discussion of the visuals, design, and heightmap of the Deshaan in this thread. The problem I see with concepts of Deshaan such as the one above is that they are too flat. Entirely flat landscapes may look nice in reality, and might even look good ingame from a distance. 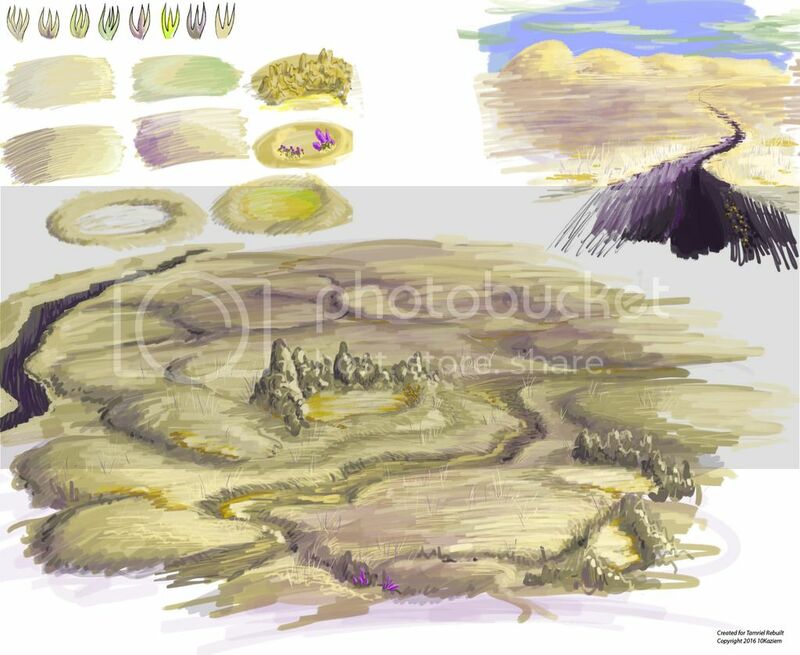 But once you're out a few cells into the plains, it'll be extremely hard to make it look good and interesting. I still propose some type of sheer cliff-pillars; this way we can keep the flatness and not have to rely as much on hills and a curvaceous landscape while still adding vertical features to the landscape without having to repeat the ashland-style of the vanilla game. It would also be distinct from any type of landscape seen thus far. Cappadocia, Turkey. Pointy cliffs. Perhaps too similar to the ashlands. 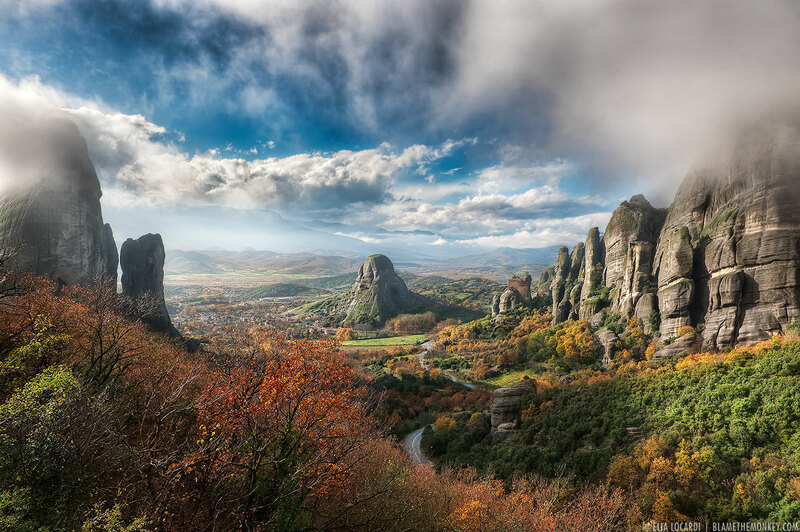 Meteora, Greece. Sheer cliffs with flat:ish tops, smooth surfaces. Notice the clifftop settlements to the right in both pictures. Somewhere, America(?). Sheer cliffs with flat tops, more wrinkly and sharp surfaces. 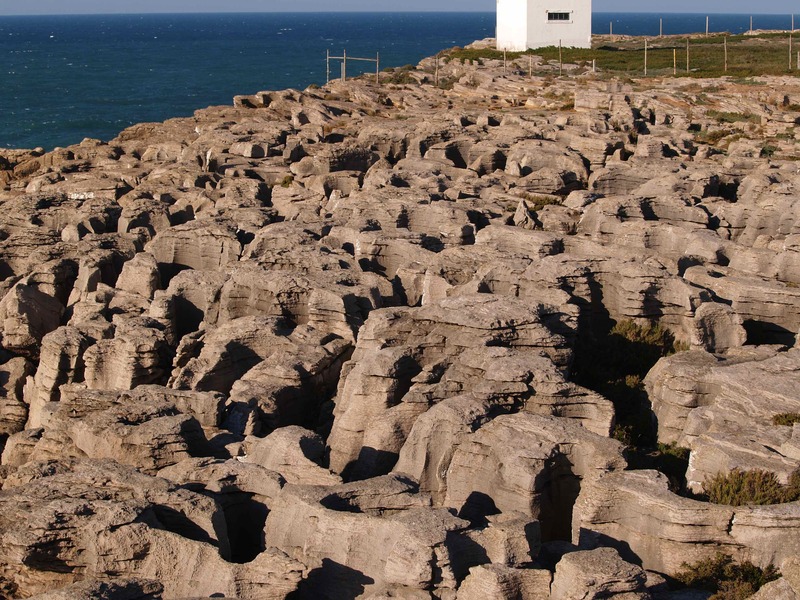 Of these, flat topped cliffs get my vote. The flat top can be utilized for settlement spaces (as per my previous Dres concept) or any other purpose. I agree that the Deshaan shouldn't be totally flat. I would like to see sort of pits and depressions, but not hills. 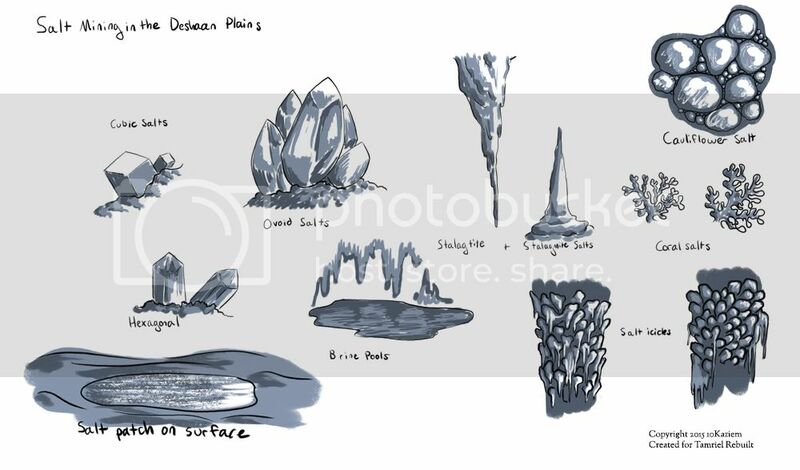 We also think the Deshaan will have crevasses and gorges, deep but thin, (and if we can actually model this it would be fantastic), which would make the not terribly varying surface suddenly quite interesting underground. 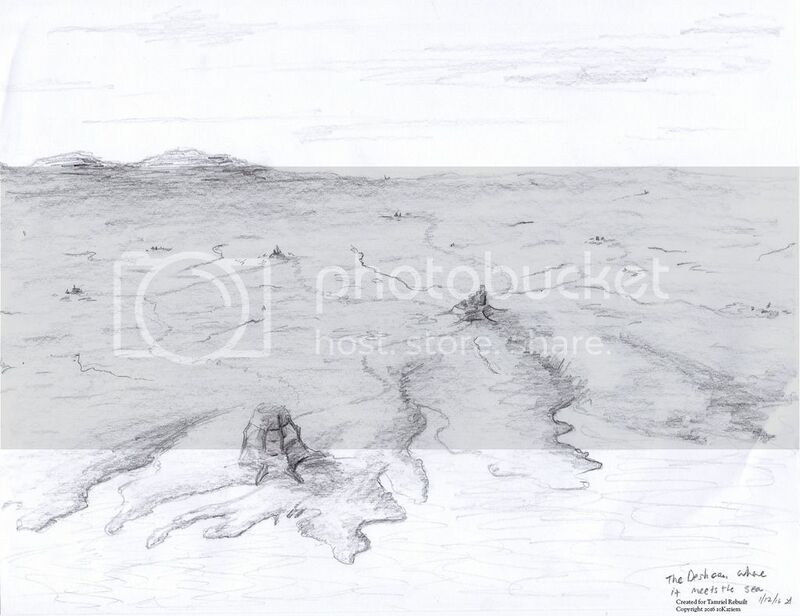 I like the crevasse-concept, it would indeed provide an interesting landscape feature. However, I think we will also need something that somehow blocks line-of-sight at ground level. While rolling planescapes might look good in a photo or a drawing, we must keep in mind that the area we're dealing with here isn't all that huge. If it were to be more or less flat at ground level, you would be able to see right across it with moderate distant land settings, and the illusion of a vast region would likely be immediately broken. 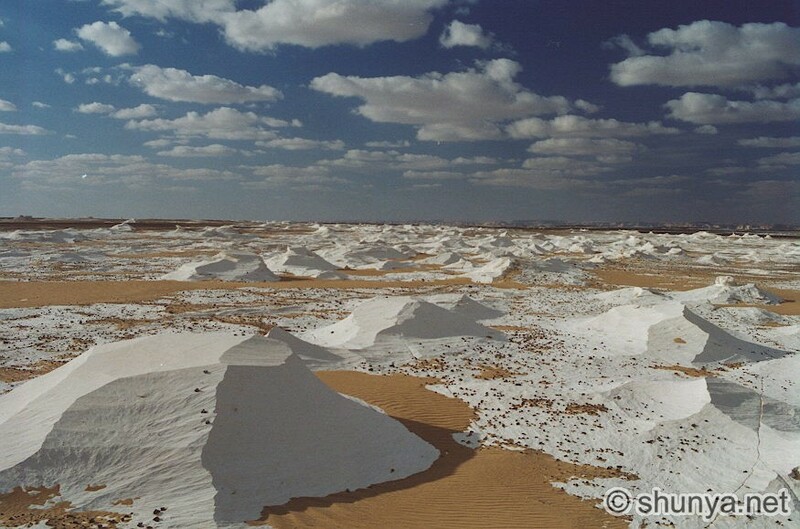 The photos of the Egyptian desert posted in the other thread [10Kaziem edit: I moved those pictures to this thread, they are a few posts down] are really good inspiration as far as palette and texture goes, but I don't think it is a type of landscape that we can make work in a satisfying way. 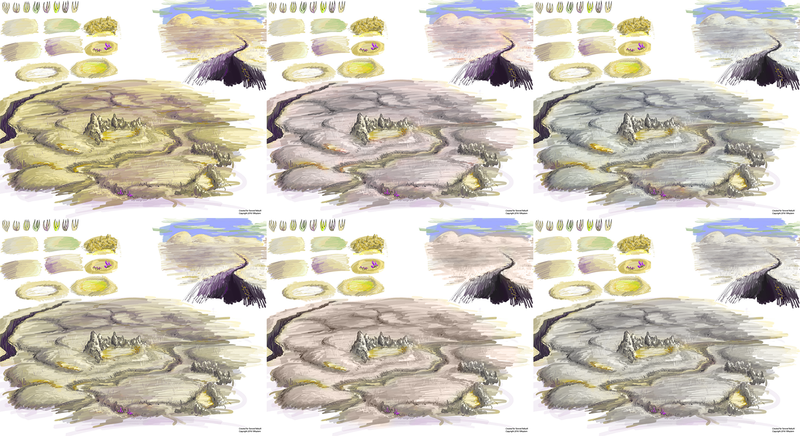 All four landscapes pictured rely on flat surface features that the TES3-engine can't properly replicate, such as the sharp, low dunes of the first picture and the swirling dired-out riverbeds of the second one. With what we've got to work with, similar landscapes might work for 2x2 or maybe 3x3 continuous cells ar most, but will then need some type of vertical feature to break the flatness. I still propose high, steep cliff-pillars punctuating the landscape. It would provide the desireable vertical features without relying on curves or a sloping landscape. 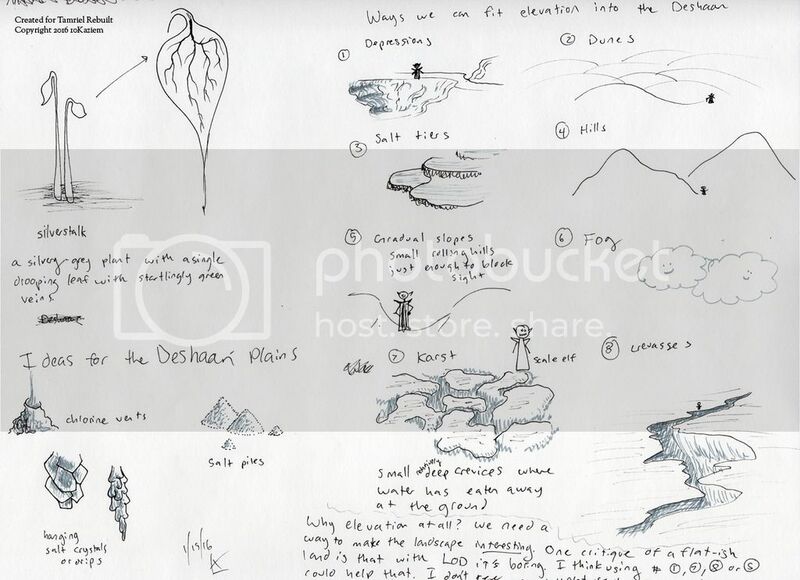 They'd actually combine perfectly with the idea of crevasses: the high plateau might become increasingly cracked and frayed, criss-crossed by crevasses, as you travel south-east, until the plateau breaks up into clusters of tall cliffs and later a wide planescape with the odd cliff standing sentinel over the landscape. I'm actually going the opposite direction: I think the Deshaan plains should be made large enough so as to look impressive even with distant land on. To that end, I think most of its western border should simply be a ridge the whole plains rise up to (brown in the map below) before dropping down steeply to Lake Andaram, rather than a mountain range, so that there is no visible boundary there; that the Orethan regions and Nedothril Coast should be part of the same plain (though they would not be as flat); and that the coastal mudflats region and Argon Jungle should be at roughly water level, also not providing a visible boundary. Now of course such a massive plain would have to be broken up to remain interesting, and there are any number of ways to do so. 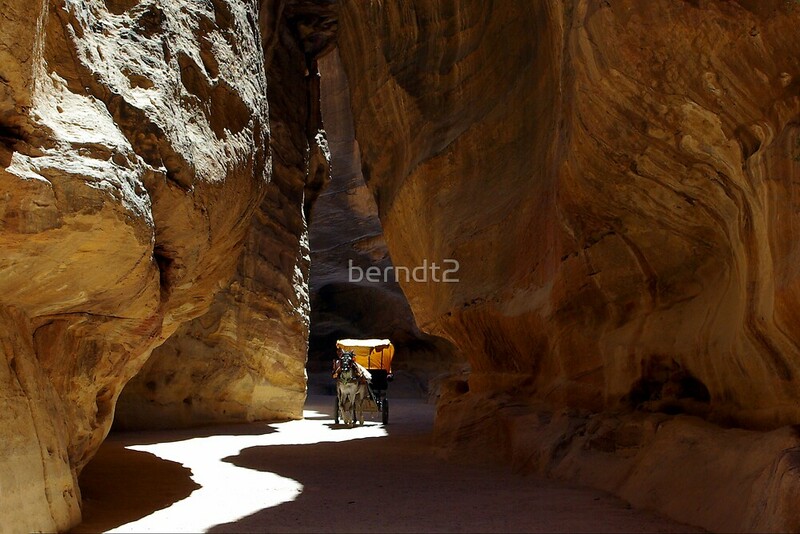 Leaving the other regions aside, I do think we should avoid significant hills/mesas/cliffs for the Deshaan, though. To me, Morrowind is hills. It does everything with hills. 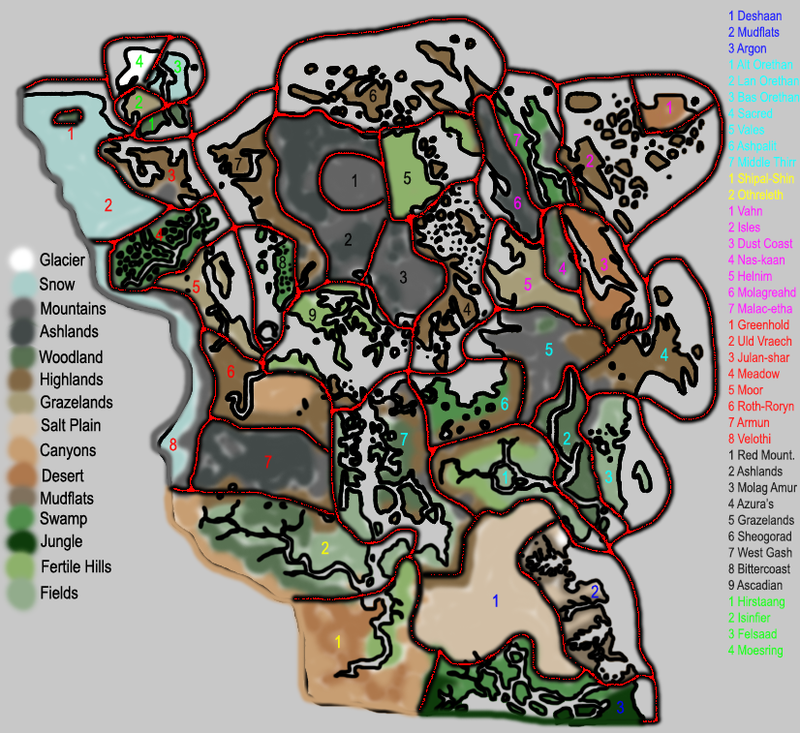 You have hills in Telvannis, hills in Velothis, and Vvardenfell is a pile of hills. You get all kinds of hills; flat tops with steep sides? Try Roth Roryn or Shipal-shin; TR loves cliffs as much as vanilla Morrowind loves hills. 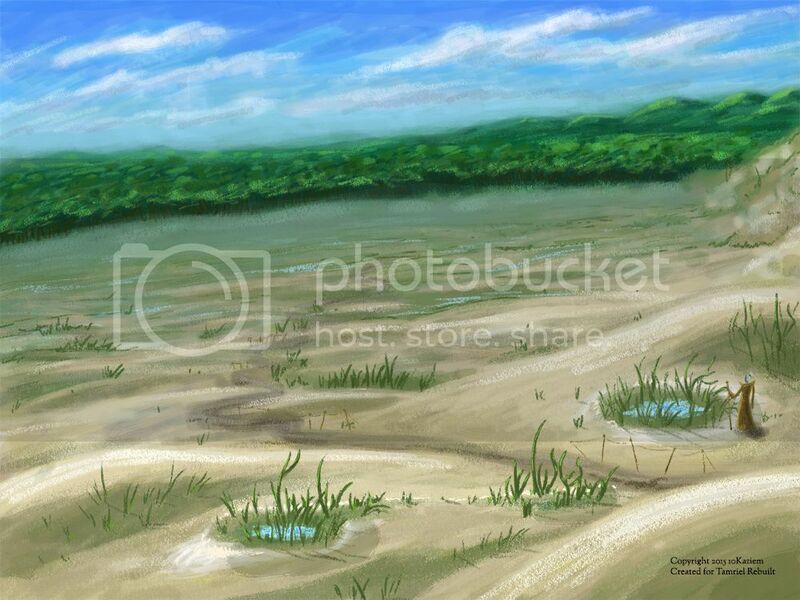 I think the vast Deshaan plains could play a very important role in providing a break from all the hills. 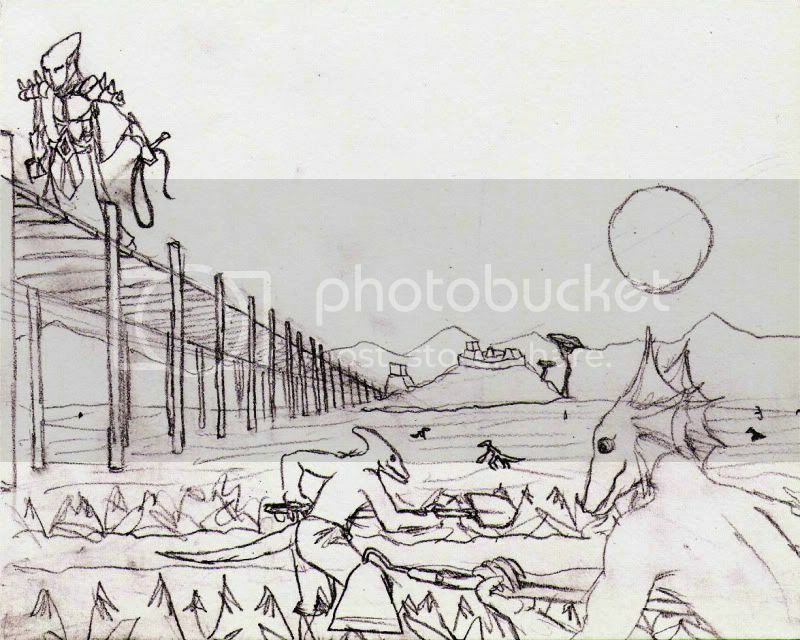 There are other aspects; leaving the terrain mostly flat would theoretically allow us to add large creatures like siltstriders or in general creatures with very broad bounding boxes to the plains without looking very silly. Also, I think that -- if all is done well -- the flat terrain could give the region a sense of drear I think it needs; the Grey Meadows provide an excellent example of that in my opinion, being a very flat region much smaller than the Deshaan. I think the Grey Meadows in general provide a good example for a flat, interesting region: it is a challenge to make a region interesting without extreme differences in elevation, (though again the Deshaan will at the very least have crevasses), but I think we can pull it off and, again, to keep things fresh and to give the Deshaan the right atmosphere, I think we should pull it off. I do think that the purpose of your sharp-sided mesa-like hills will be fulfilled to a large extent by the Dres clansteads, though, which to me provides another reason to avoid sharp rises in elevation as you suggest: they will draw attention away from the clansteads, making the clansteads look less visually impressive; it's a very different thing to have a massive canton-like structure rise out from the middle of a plain than to have it rise up in a plain dotted with mesa-like features which may or may not tower over it. I very much like your concepts, but also agree with EJRS. I've always had the Deshaan in mind with some depth or embossing. Differences in height are necessary to keep things interesting for the player. However, it shouldn't be a very hilly area. I think terraces. Wet ones, dry ones and salty ones. Note that these images may have much more height than I imagine Deshaan to have. 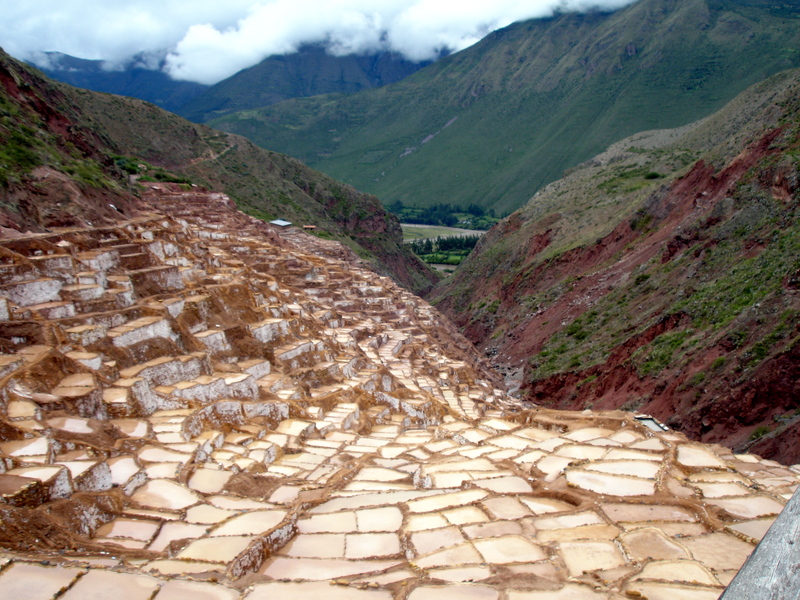 I very much like the idea of the salt terraces or low mesas which could be used to break up the area without taking away from the impressiveness of the cantons. Just don't turn it into yet another hillscape with sand instead of grass, and I'm sure I'll love it. Agree with Gnomey wholeheartedly that the PC could use a break from the constant hills, heh. 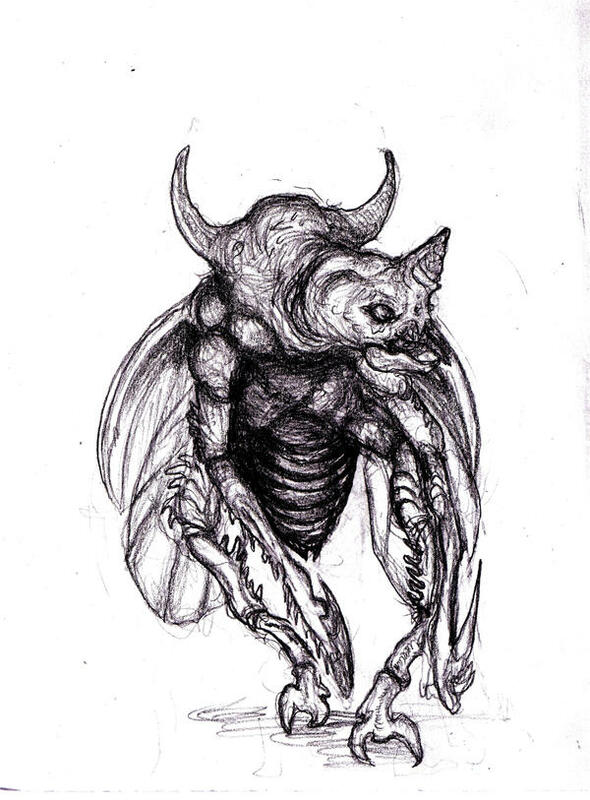 The image below is fan art of the Diablo II creature "Scarab Demon", a hellish mutation of the scarab beetle. In Diablo II they dwell in deserts and dry tombs, and look quite different from the one depicted here. I very much like the art, and could see a similar creature in the Deshaan. Image was found here on Deviant Art. Has anybody played Xenoblade Chronicles X? 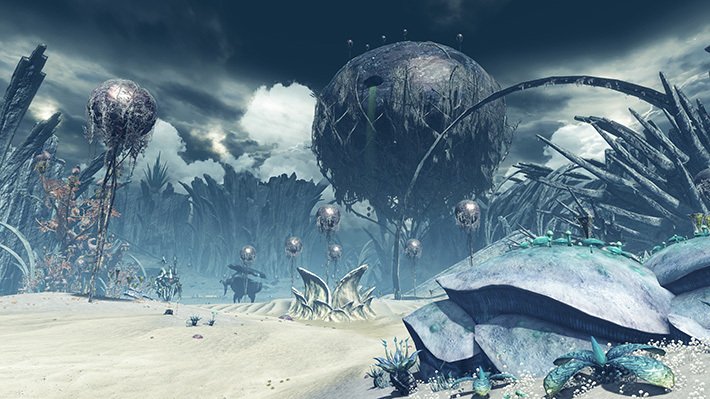 I only bring it up because the Continent of Sylvalum is worth looking at for how mushrooms, deserts, and saltflats fit together in a cohesive, alien tone. I know TR has to be different, but it's worth looking at what others have done with a similar concept. lost to mind and space. Yeah, tried including the picture – if I edit my post, the picture icon works, until I publish it, and the picture disappears. Not sure. Seems to be a glitch for me with the new forums. Those balloonesque mushrooms are one idea they bring. The whole area is worth checking out other pictures of too. 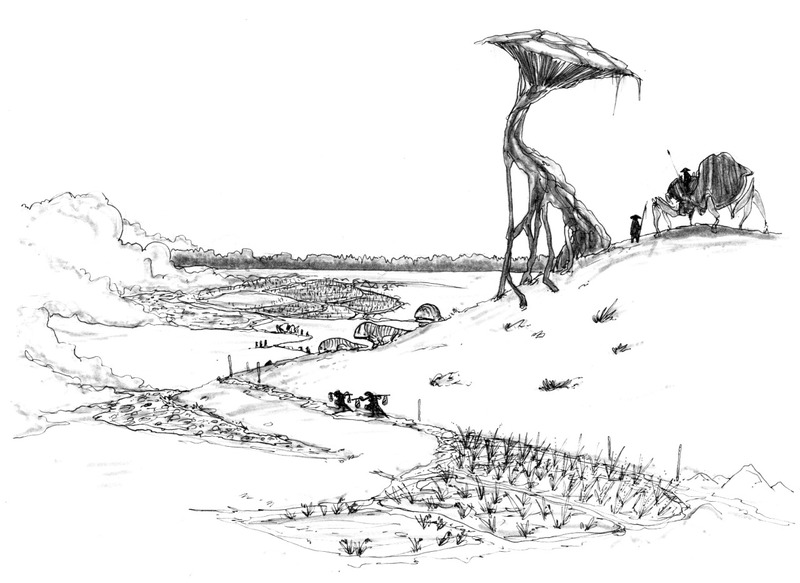 Obviously, not quite the direction we're going in, but we should be creating a salty wasteland that's at least as internally consistant and weird as this is. I made some new art. Click on the pictures to see their full size versions. A quick sketch of what the colors might look like. This is a view of the northwestern Upper Deshaan, with the viewpoint looking northwest. Then, some of the plants. Saltstrap, a plant that varies from very small (knee-high) to very large (tree-size). Its broad leaves are tough and useful as a building material. Grows only in the driest areas. 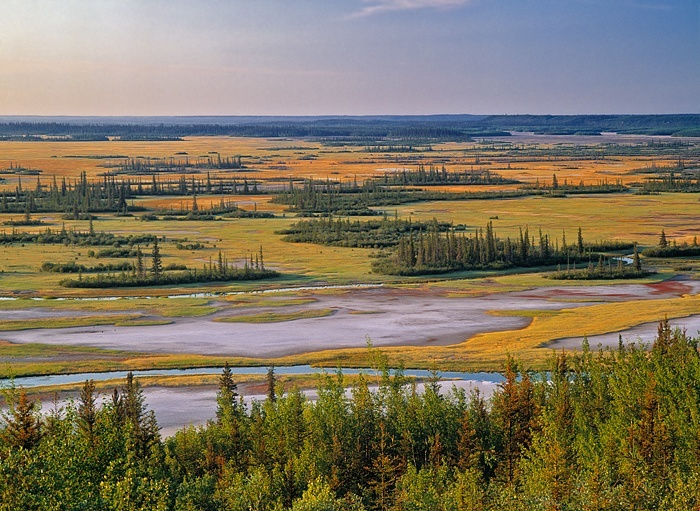 Glasswort, which grows only in the very south where the Deshaan plains meets the salt marsh/jungle of the upper Black Marsh. 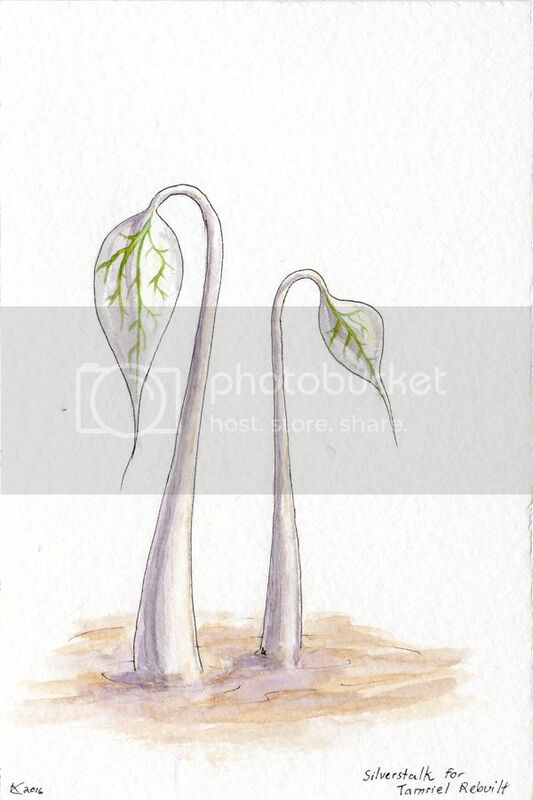 Silverstalk, a plant that grows in dry areas, found near and around dried brine pools mostly. Generally around in the upper Deshaan. Saltgrass, a generic whitish grass, static. 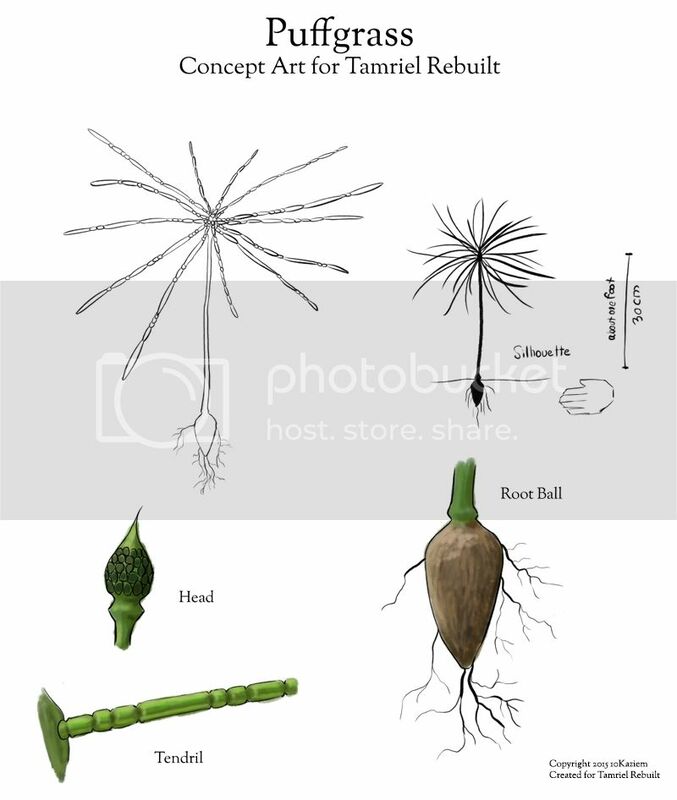 And then spindlewort, a bamboo-like plant that grows with holes in it. Its reedy, hollow stems make an eerie howling noise in the wind, and it is frequently carved into ersatz musical instruments and wind flutes. Static. Last, the plant on the left of this picture is a pod/cactus type thing that might be useful. It is small, the size of a hand, and a dusty but bright yellow. (Maybe is full of salt water or weird crystals.) The other plants are for different areas outside the Deshaan. Reposting some OLD concepts for the Deshaan. Basically, the cross-section of the cave would be divided into an upper and lower half. The lower half would be fairly uninteresting to the player; just a place for the riverstrider to swim in. It doesn't need to be as deep as in the CS mock-up. 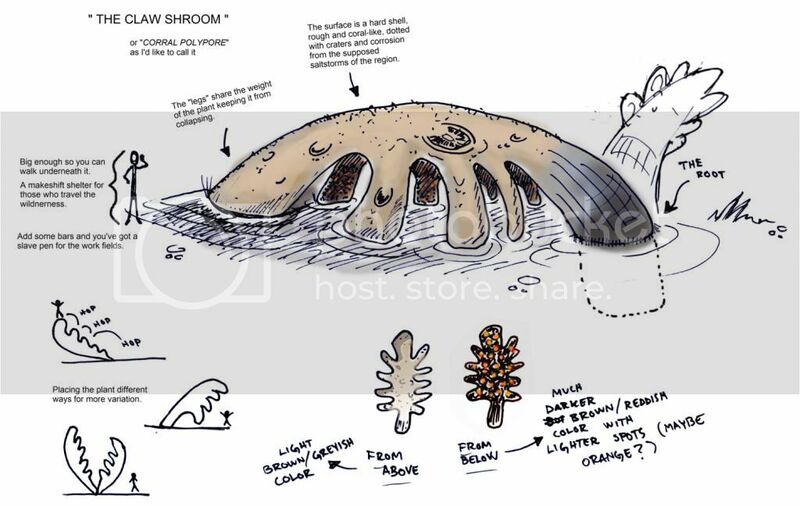 The upper half should be more spacious and should have a generous number of stalagtites and salt crystal structures, and is mostly there to provide pretty visuals. The two sections would be divided by a ledge, which would be the most interesting to the player. 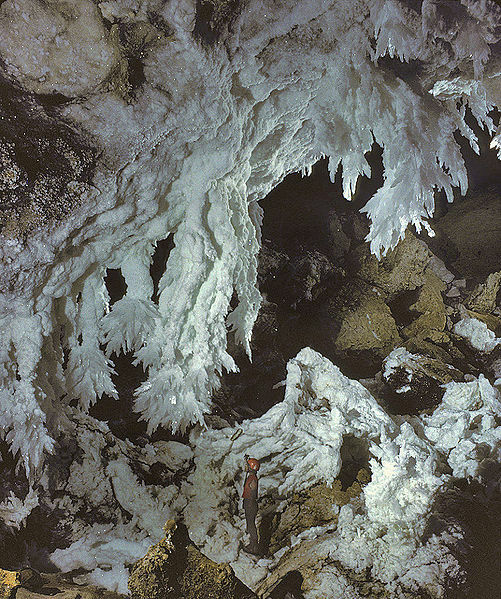 It would be riddled with stalagmites the player has to navigate around and any flora that might grow there and the sides would be lined with salt formations. The ledge would vary in width, and sometimes the upper level would budge outwards creating an alcove. These alcoves would sometimes contain hostiles, sometimes a cowering escaped slave, and some would be Dres depots, generally beneath a settlement. These depots would be linked to the surface, and in the case of saltrice plantations, which would generally be located at the terminus of a canal, would contain the lower end of the massive pumps/wells/whatevers the Dres use to haul water up to the surface. More rarely, a hole in the upper half might lead off to a small cave, which would be handled as a separate interior. A few caves should lead to the surface. Now personally I don't think the fact that the Riverstrider barely would have any room to turn in matters. If people care, though, the canals could occasionally broaden out into turning basins. Any areas open to the exterior would not, I think, need to follow the above guidelines very closely. The interior/exterior transition is certainly a bit of a question, though; I think the Skyrim route of teleporting the player through the entrance when he approaches it is the way to go, but naturally for the necessarily gaping entrances the visuals might be hard to get right. For the most part the canals would be pretty linear, much like the Vivec sewers, and like the Vivec sewers often the player would only really go there for quests. Perhaps a more pertinent comparison would be to foyadas, which fulfill much the same function, and also tend to be very long and contain very little of interest aside from function and visuals. 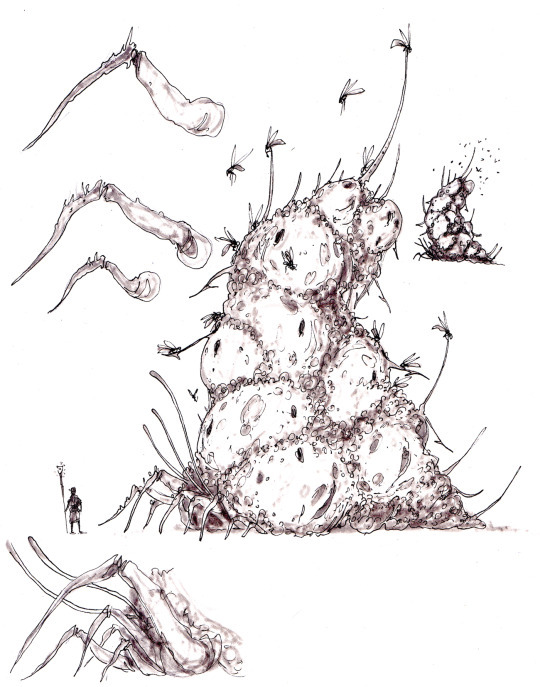 That being said, I still think the canals would be worth implementing, between the visuals, role in the travel network, importance to Dres society and Morrowind's economy and relative ease of CS implementation, certainly compared to more complex massive underground networks that have been suggested before. I don't know if theys will help or give any insperation, but here some pictures from the alberta salt plains. I think there nice because most of the pictures posted have a very plain colour palete, but this is very exotic which I think fits nicly in Morrowinds weirdness. 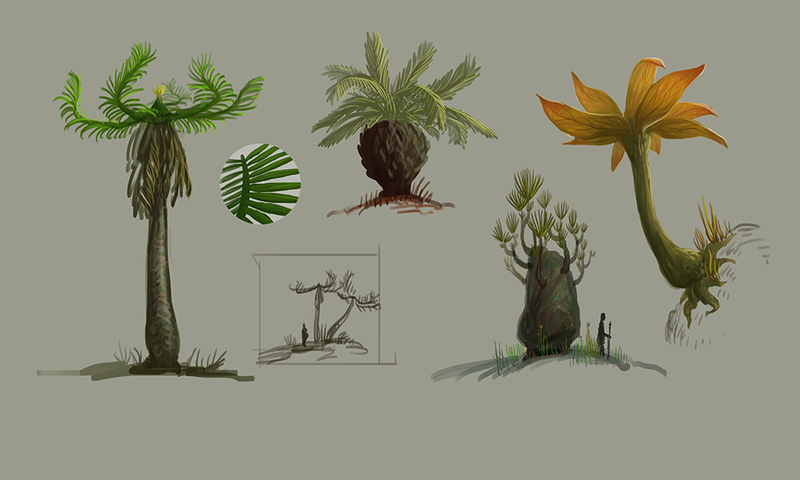 We could also take inspiration for how the trees apear in groups sort of like an oasis, but we can obviously put some form of exotic flora there instead. Thanks for those images. 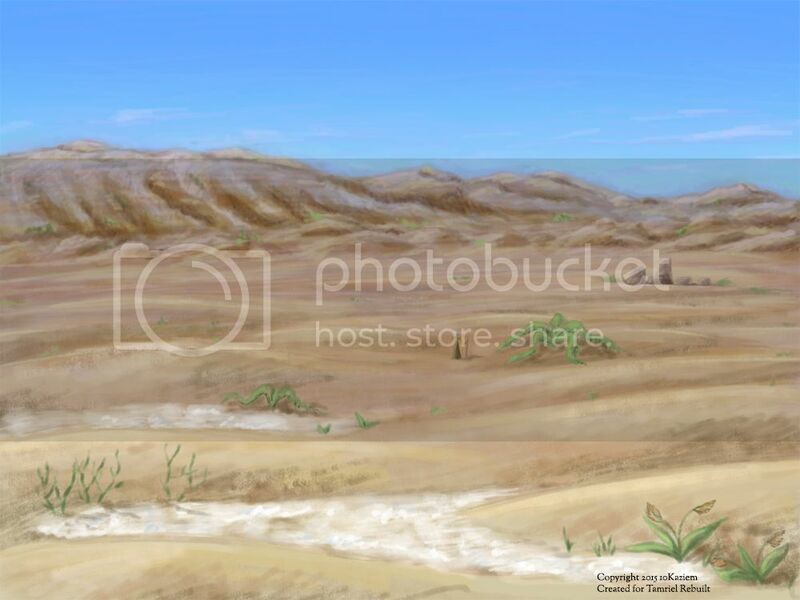 A point I actually wanted to bring up here is that I feel as though we were going in the direction of making Deshaan a vast desert rather than the fertile plain it’s supposed to be. 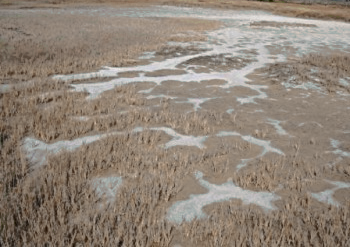 It has its brine pools and chlorine clouds and salt formations, but those things should generally not be toxic to the native plants and animals in my opinion; rather, the native plants and animals thrive on them. 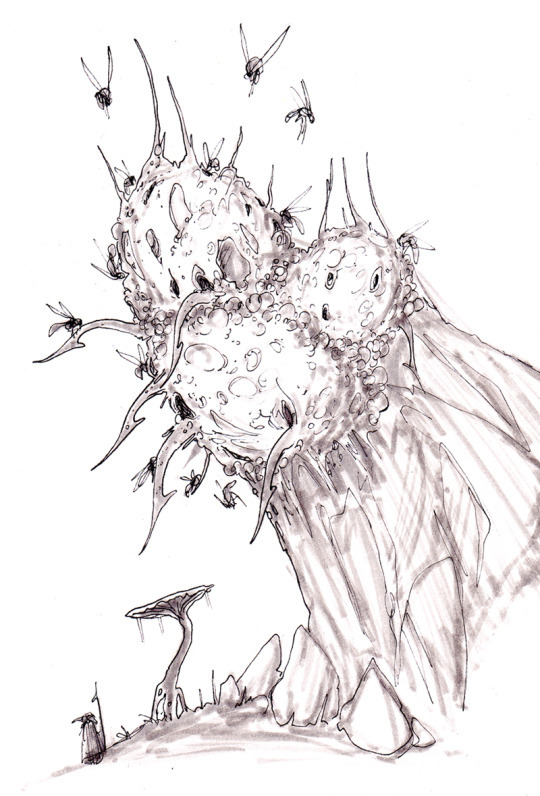 It’s everything that isn’t native to the Deshaan – which includes the Dres, who have since adapted to the conditions – that finds the place utterly toxic. Minus the trees, and with the grass matching the beige colour palette rather than being green, you’re images are pretty spot on for how I imagined the Deshaan. I don’t think the Deshaan should have an equivalent of Ashlanders aside from the Dres themselves. Any group living in the Deshaan aside from the Dres should if anything be less traditionalist than the Dres, not more. The Ashlander clan traditions are still very apparent in the House, and even the semi-nomadic lifestyle is maintained to a degree by the bug-herding Chap’thil, as is the ancestor worship. I think contrasting the Dres with a more traditionalist group would only water the House down. That being said, it could be that your art would work for the Chap’thil; I look forward to seeing it. thanks for waiting, i’ll have these scanned, and more art scanneed tomorrow, tell me what you think in the mean time. I REALLY like that image with the boardwalk, above the Argonians’ heads, complete with the overseer on his mount above them! I’d be disappointed if something like that didn’t show in the mod eventually. 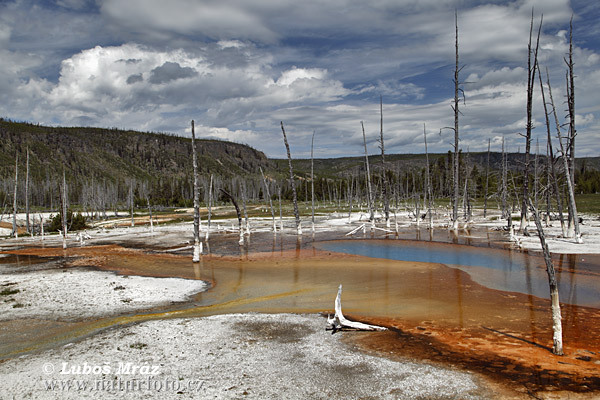 Here’s more possibilities for “fertile but toxic”: think Yellowstone, just with less pine trees. EDIT: And again with the big images. I’m using the insert image button to resize things and it looks right in my post editing window, but for some reason isn’t taking. 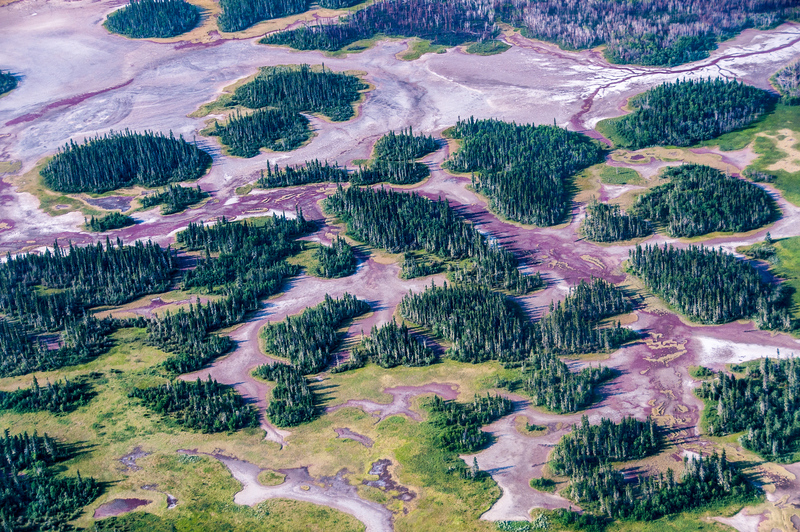 And a few places like this out in the boonies. Note the green trees in the background, which make this less of a big ashland region, and more of an isolated pool where toxic chemicals have pooled from geothermal activity underground. Ancestral Tombs – I don’t think these should be found in Dres lands, as the Dres never adopted the tradition of family tombs, probably rather having more archaic ancestor burials like the Ashlanders. I think it would make the most sense if the clan burials were located within the Clansteads, as unlike Ashlander camps Clansteads naturally don’t move around. An argument could be made for having one or two long-abandoned ones, though. 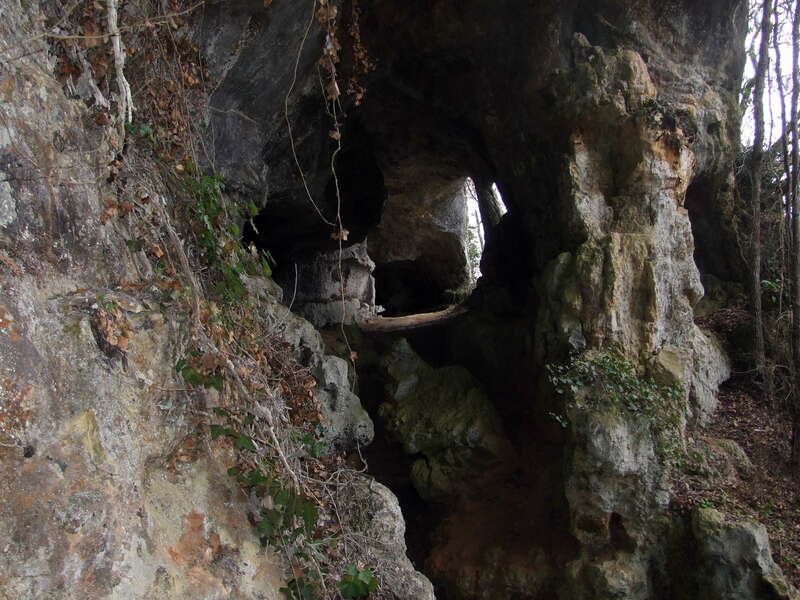 Caves – while these are generally ubiquitous, given the flat nature of the Deshaan they might be less common than elsewhere; most of Deshaan’s caves would probably be part of the canal network as above. There would still probably be a few natural caves in nooks and crannies, however, and we could also consider insect burrows. (Not Kwama). Daedric Shrines – I think any Daedric ruins should generally date from before House Dres formed as a House, so I think they should be few in number and probably mostly found in the northwest. Most modern shrines should probably be Dres in style and wouldn’t be ruins. I think any Daedric shrines in the Deshaan should be very well preserved. Dunmer Strongholds – these would be the Dres clansteads and in the Dres set, not ruins. Dwemer Ruins – I don’t think the Dwemer should have any presence in the Deshaan. 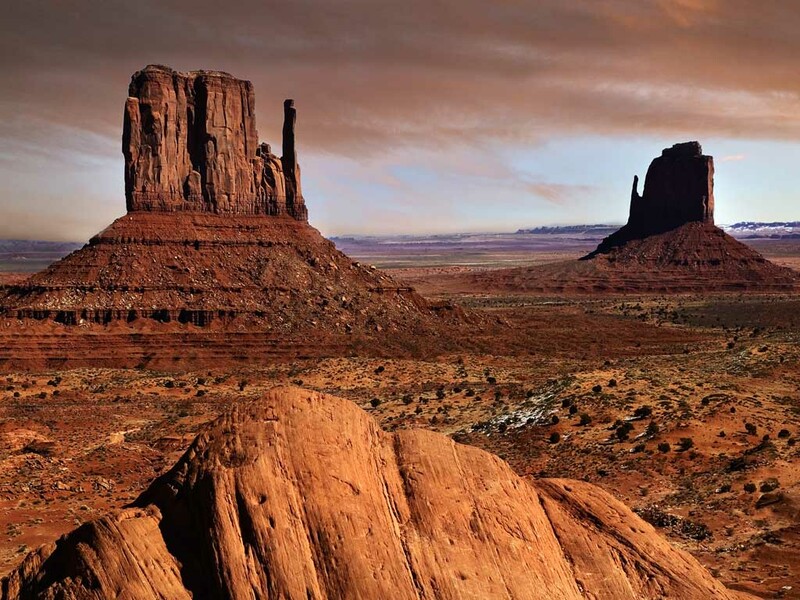 The Deshaan is far from Red Mountain, so probably has few precious metals and little to no tectonic activity, and is very hostile; they’d have nothing to gain from settling there. Mines – I think there should be few or no traditional mines, and certainly no egg mines. Velothi Towers – Velothi towers are generally built in mountainous terrain, which the Deshaan has very little of, and were probably built either by the original Velothi pilgrims or are otherwise very ancient in origin, and the Deshaan was probably only settled relatively late. I’d expect one or two towers along the western edge. Skyrender Nests – these would naturally require a new tileset. On the whole, I don’t think the Deshaan needs a high density of ruins. The exterior would be dangerous enough, and then between the canal network in the northwest, the Skyrender nests looming on the horizon and the occasional natural cave and insect burrow I think we’ll be pretty well covered, with the possibility of Daedric shrines if we want more traditional ruins. Hey St. Veloth, can you upload your pictures to the internet? Imgur is a decent place to put them. It’s harder to for people to see and react to them if they’re filed away in a zip. The salt of the Deshaan could and should probably have a few colour variations, but a stark, perhaps even slightly bluish white will probably be predominant. I’m not too sure what colour the dirt should have other than that it should be pale; a very light brown or red seems likely. The grass should, I think, be a very subtly vibrant beige colour as pictured, to highlight that the flora is flourishing and not dessicated. Green should generally be avoided; it certainly should not be the default colour of plants. I’d generally deemphasize the arid nature of the Deshaan. I’m not even sure if the Deshaan should be an inherently arid region. 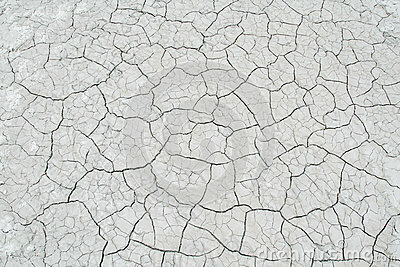 The dry nature of the region comes about from its high salinity, not the broader climatet. 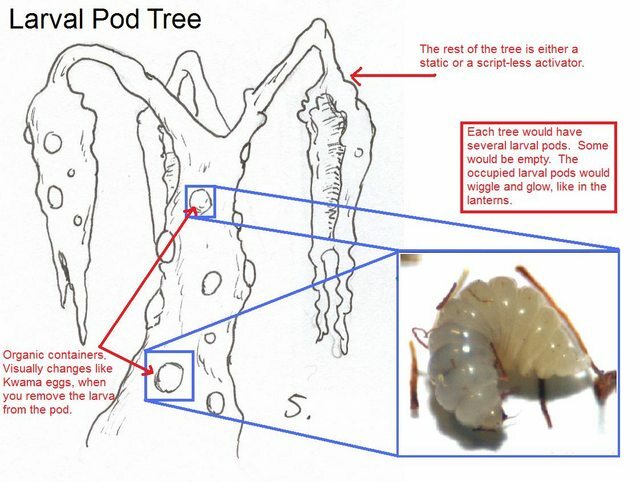 Saltrice - we need new models for Deshaan slatrice; it needs to be as sparing in polies as possible, cover as much ground as possible, and should probably be a bit larger in size. Three variants might do the job. 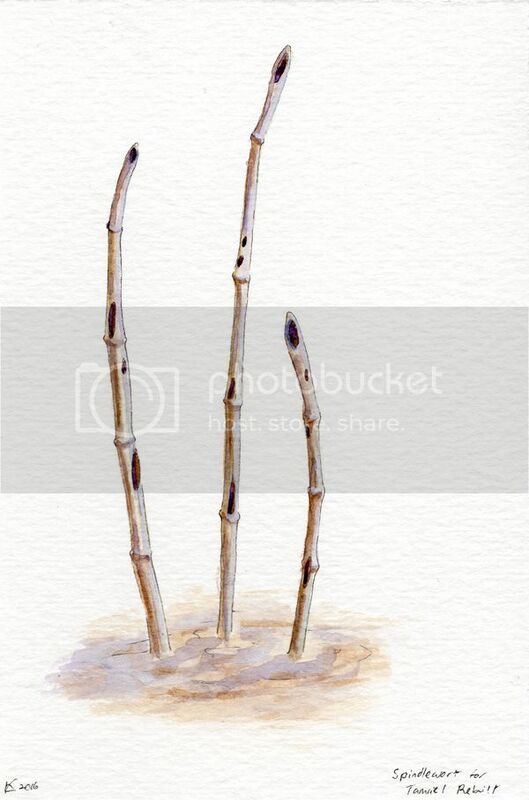 Marshmerrow - this could maybe be found in the mudflats, but I’m not really in favour of it. I certainly don’t think it should be found elsewhere. I think the translucent milky white could give the plant a nice ghostly appearance and add to the atmosphere of the Deshaan. The reddish hue could add a splash of colour to the region to avoid the Deshaan looking too monotone. The golden hue is unusual, and could lead to some interesting colour contrasts. I think this plant would work better scattered out in the open plain. Two or three variants should do, more wouldn’t go amiss, especially if we want to have them grow in clumps. For the dried out leaves, I tried out the alternatives of the leaves being caked in salt blown by the wind or having been steadily mummified until stiff and dark. For the leaves that aren’t dried out, a pale colour would accentuate the overall paleness of the region, a darker colour would create a bold contrast, while a relatively vibrant but washed out reddish colour would lend the plant the appearance of a massive but warped flower, which aside from looking pretty would also play nicely on the Skyrenders as massive but warped wasps. 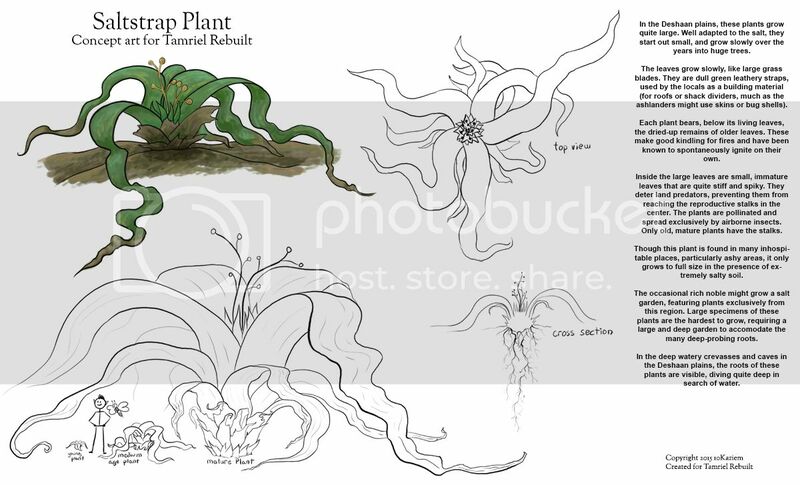 I think this could be managed with five variations for the big plant, four for the medium and three for the small, but the alternative of making it modular also works. 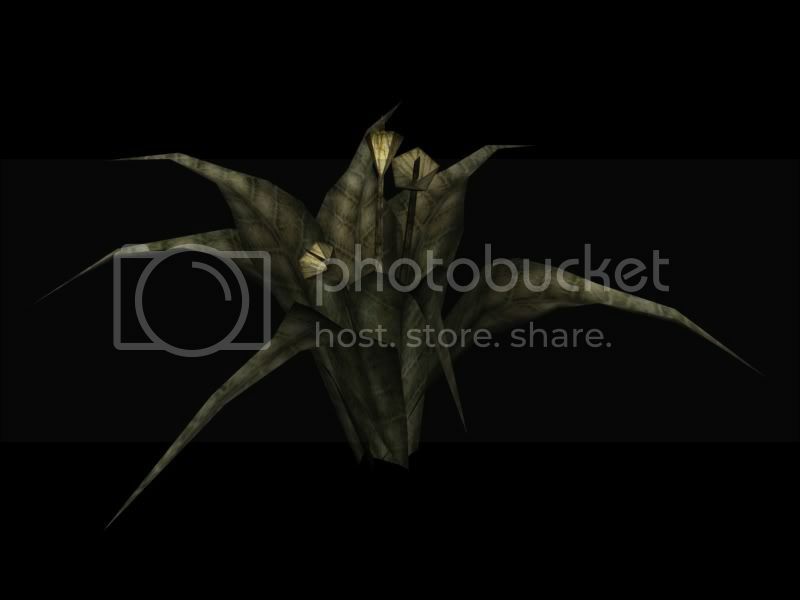 Untitled plant 1 - I like this one. Two to four variations should do the trick. 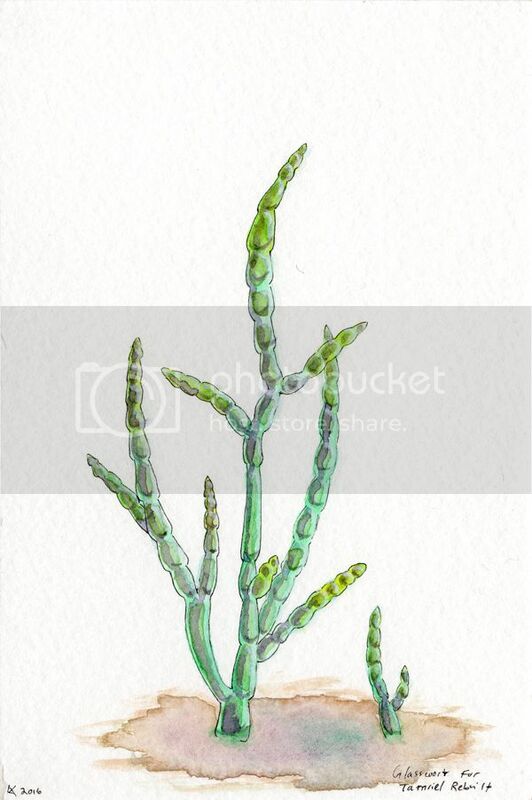 Glasswort - I think this one should have a broader habitat, though perhaps it could still be restricted to lower altitudes and thin out as the plain rises up. This time I’m for keeping the colour; if the other changes are made the green will be the exception rather than the rule. At least two variants. Tribunal cacti (introduced in trib.exp.) - I don’t think these work in the Deshaan, though I suppose if they’re really limited to the very border of the region it might work. 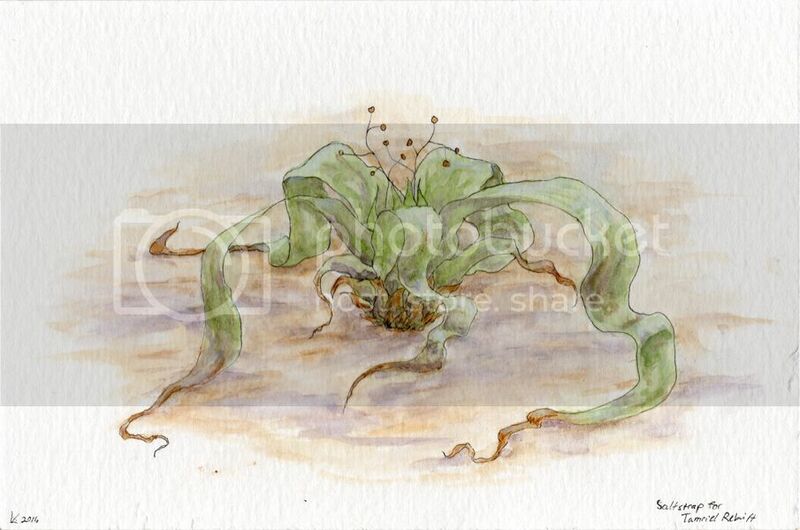 In general these cacti bother me, especially the Desert Sweetbarrel with its vibrant colour that probably won’t fit well with Shipal-shin and certainly won’t with the Deshaan (which isn’t a desert anyway). I’m tempted to suggest that they’re foreign imports from Elsweyr or Hammerfell, but failing that I’d remove the ‘Desert’ in Desert Sweetbarrel and use it in greener regions such as the Orethans. 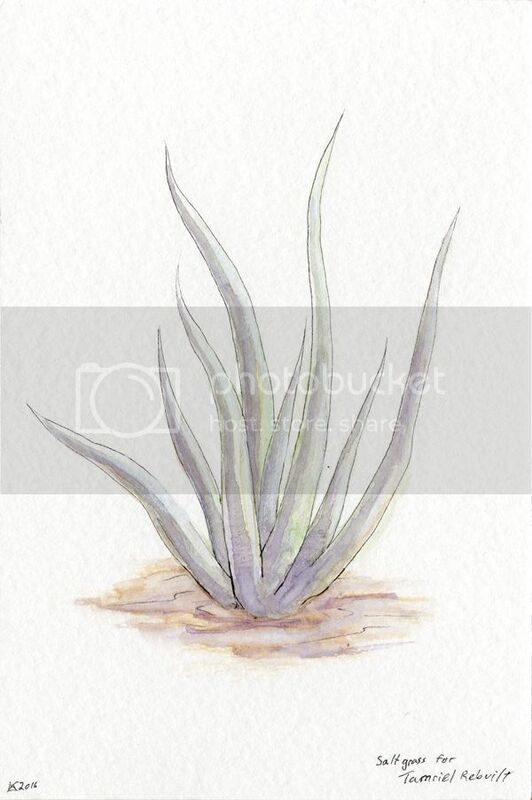 Saltgrass - I like this one. I don’t think it should be a retexture; people would notice it, and this shouldn’t be hard to model anyway. Probably needs at least three variants. Kreshweed - I don’t really like this so far south; I generally prefer its habitat as being in the vicinity of the Inner Sea. Silverstalk - I like this one. At least two variants. Spindlewort - I like this one a lot. Not sure if these should be single or in small clumps, probably the latter. Maybe something like four variants? Put together a speedpaint with some color palettes and some drawings of the landscape. 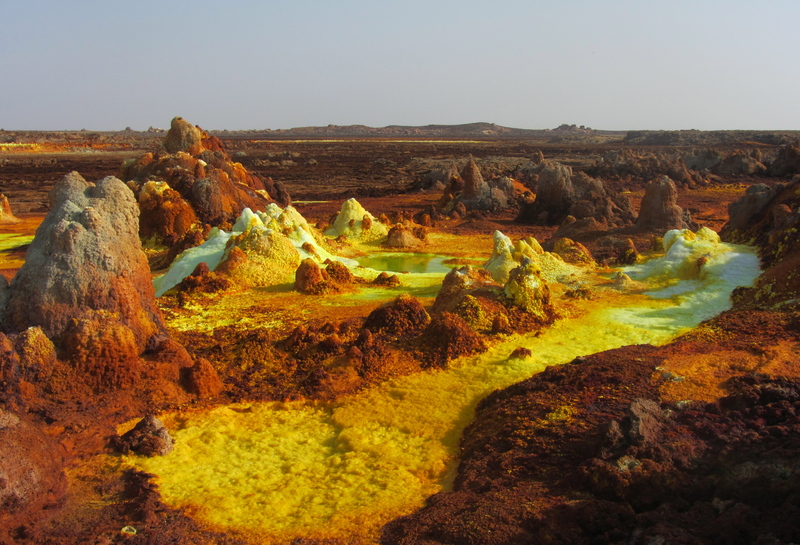 I envision a yellow-white-purple landscape, with the yellow and purple mainly shading into grey, but sometimes becoming more vibrant, particularly around the salt concentrations. 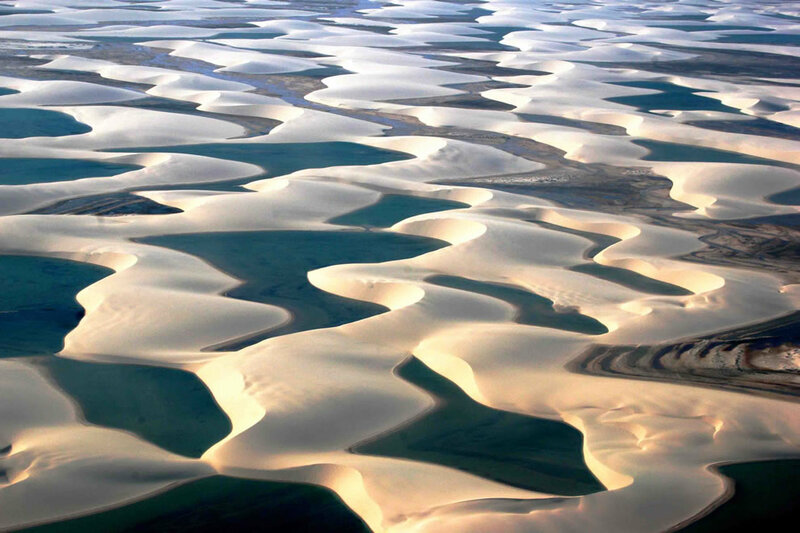 A landscape that is pocked and has hills like flat dunes, not sandy but more compacted into hard dusty low ridges. 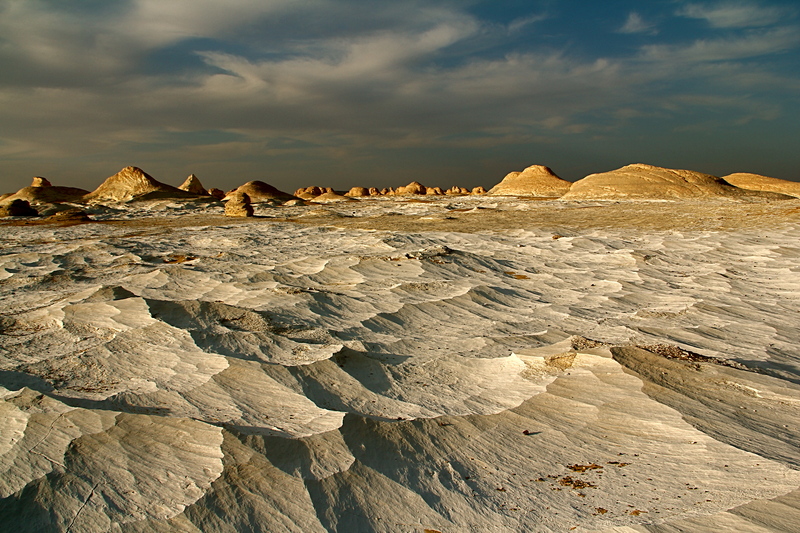 Around the salt pools (wet or dry) are nubbly salt rocks that sometimes contain crystals. 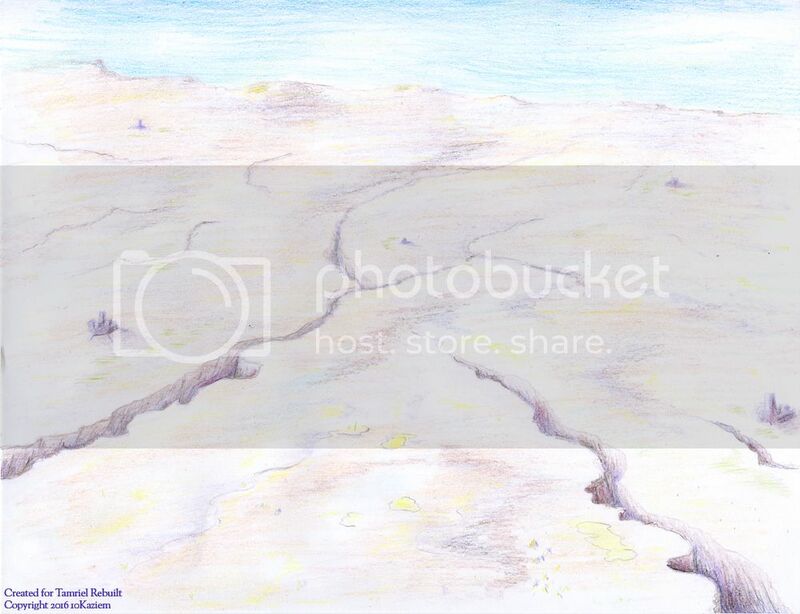 The land is riddled with crevasses but most are small, and though the crevasses are common, they are deep and hard to see. And, most of the land is solid, it’s just that if you head in a straight line you’ll fall into one sooner rathern than later. There isn’t much in the line of rocks or much elevation change, but the compacted mud type ups and downs do create some visual blockers. Some “hills” are larger than others, the landscape is very uneven though largely flat. The ground sprouts grasses consistently but sparsely; it’s not a grassland, but there is vegetation in most places. 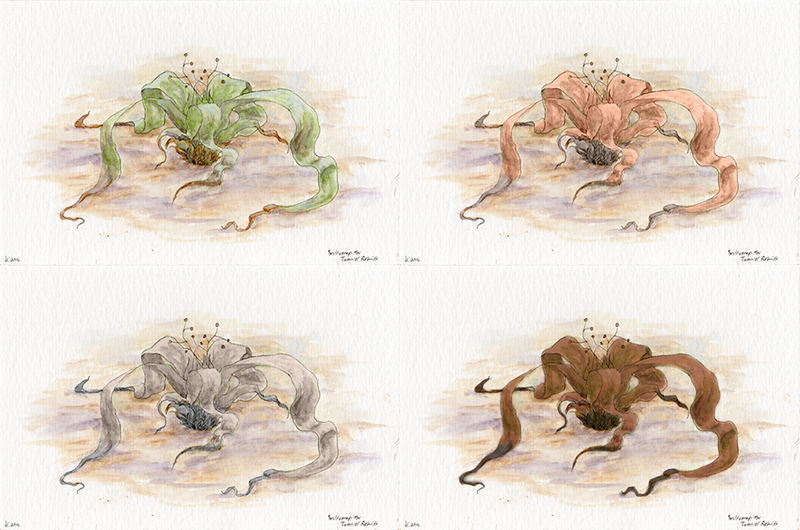 For my part, though, I still like the beige colour in my last image best of all of those. 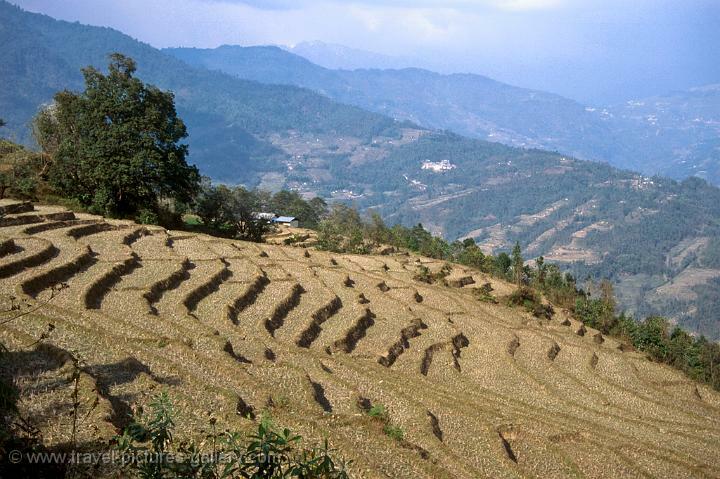 The Deshaan, as described, slopes evenly downwards to the Argon Jungle. 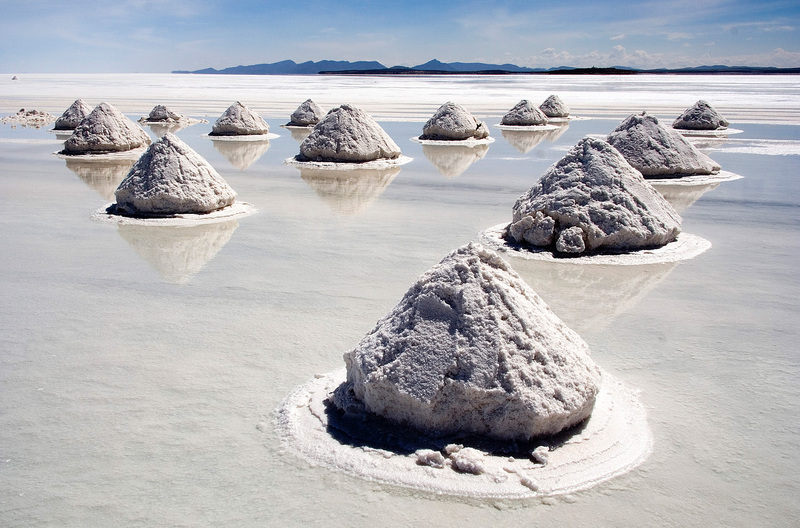 There is a large triangle of land where the land flattens out, the Salt Washes. 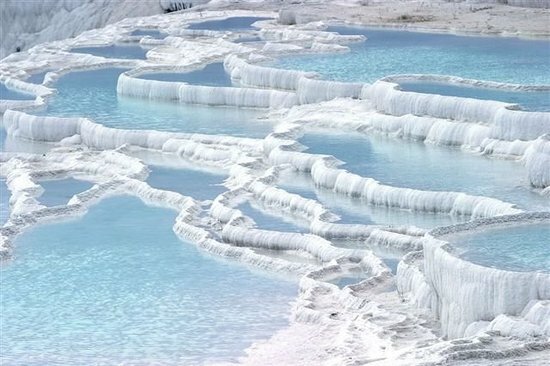 Whenever it rains in the Deshaan, (which I think it should from time to time), the rainwater flows down the slope carrying salt with it, gradually forming seasonal streams which collect at the base of the slope. The water there is plentiful and variable; some is very salty, some relatively fresh, some is still and some flows gradually southwards. 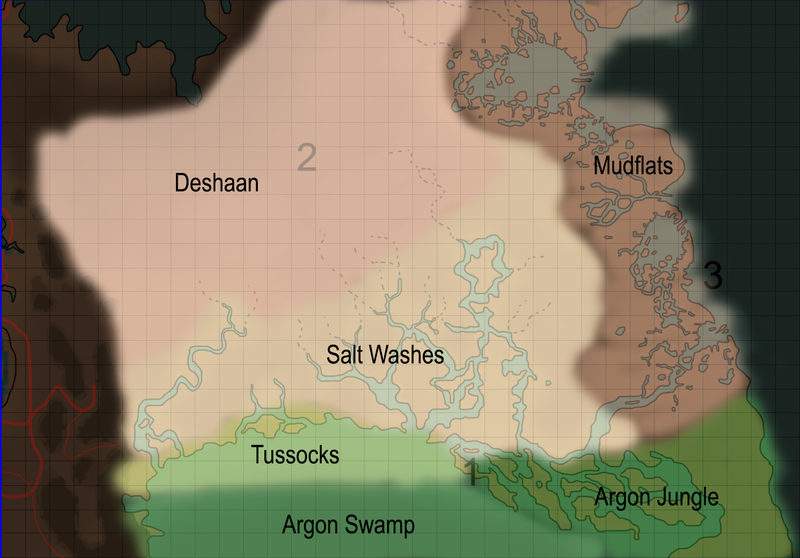 As such, in some places the Argon vegetation might be able to grow, in others the Deshaan vegetation, and other spots would support no vegetation. 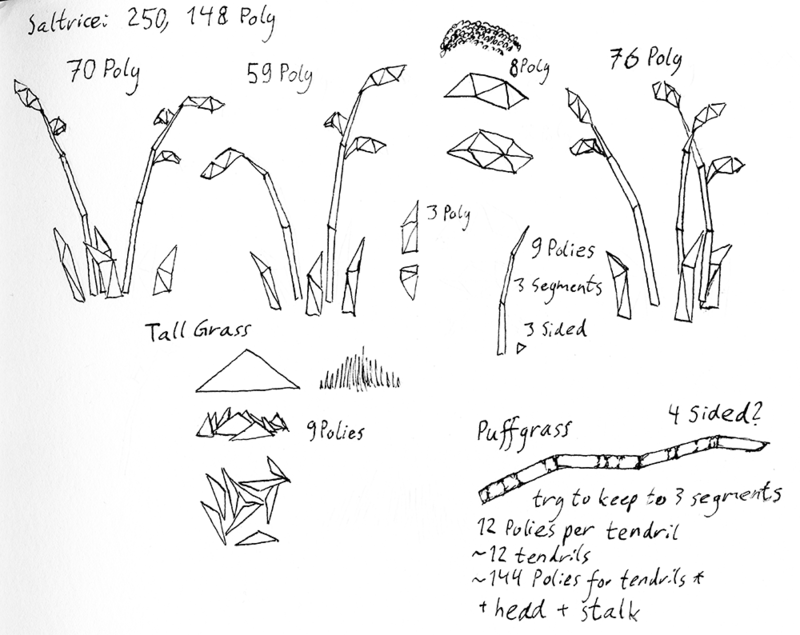 The saltrice and tallgrass will likely be placed in high densities, so it doesn’t hurt to try and conserve polies. 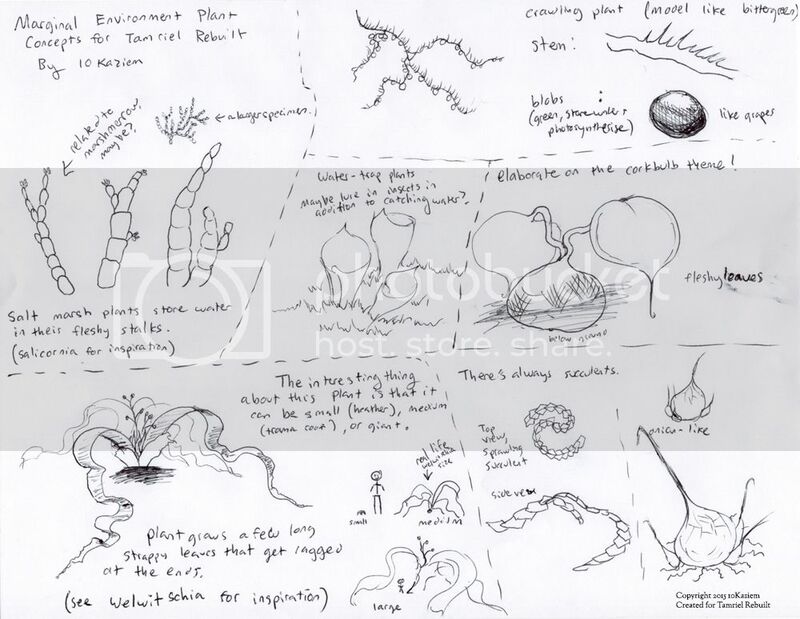 The saltrice will grow wild in the mudflats and probably salt washes, and in Dres plantations will likely be placed in paddies with a much higher density. The poly count of the vanilla saltrice models is shown in the top left. 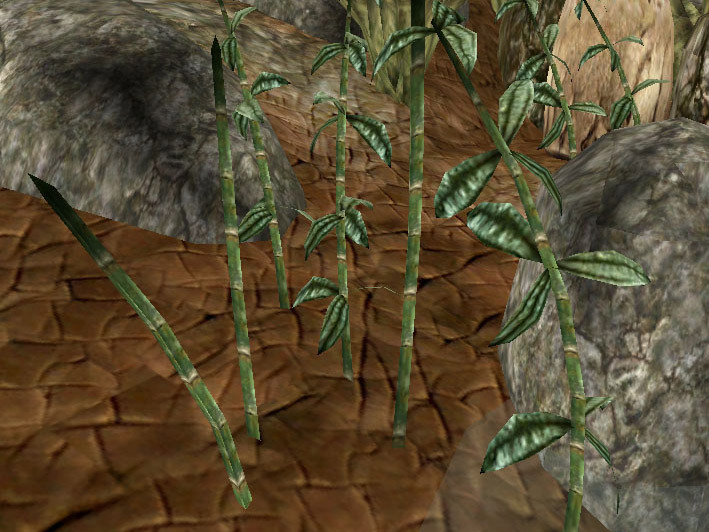 I think that in the Deshaan tall grass should generally take up the task rocks usually perform of hiding ugly texture transitions, so to that end it needs to cover a large area while using few polies and adequately obscuring the ground. I think as shown, with the right textures, we’ll be able to get a good-looking model, but more polies could be added if the grass looks too flat. The grass leans and gets taller towards the center. 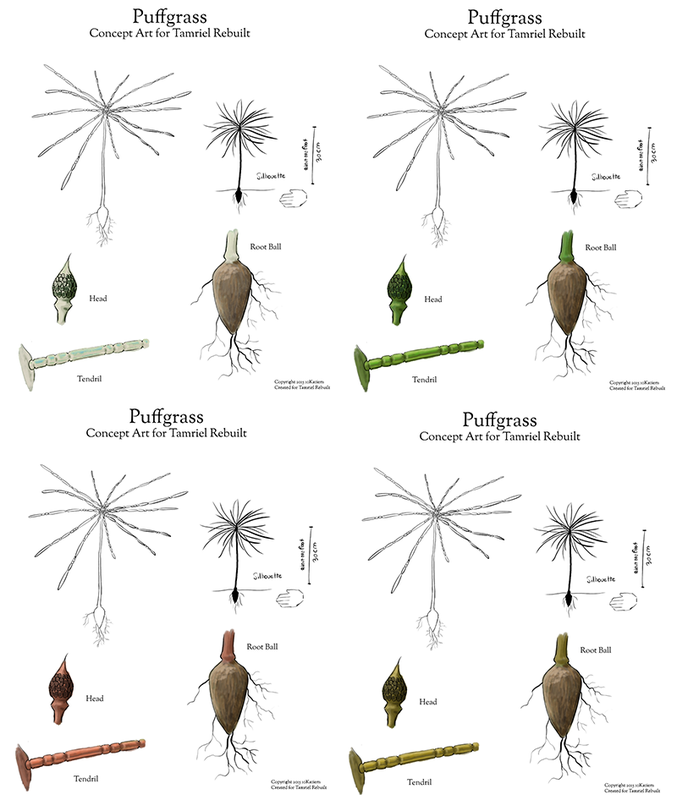 The puffgrass would be used more sparsely, so it can afford to have more polies. Also on that note, Gnomey, is that map of yours fairly accurate for the heightmap and regions? EDIT: Some other misc photographs. 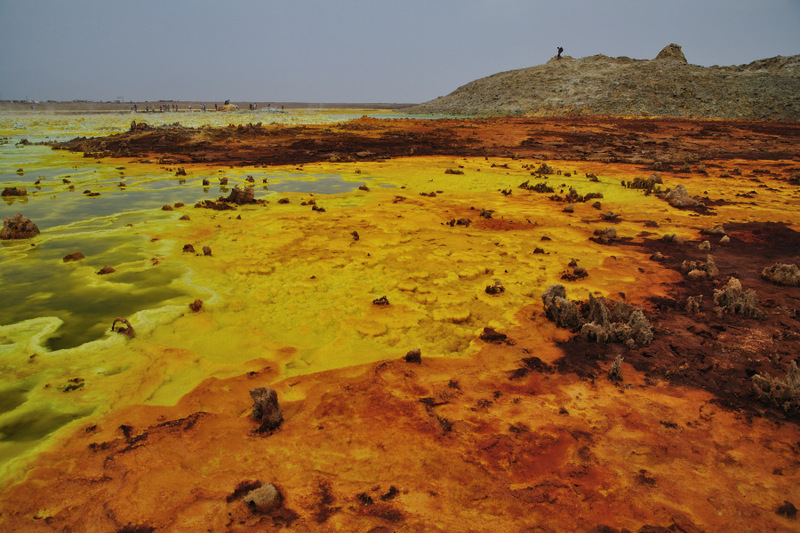 Oases, sulphur rocks, ice that could be salt, lagoons.